Gold bars can be a simple and cost effective way to enter the gold market. Gold bars typically have a lower premium to coins which are regulated and produced by specific countries. 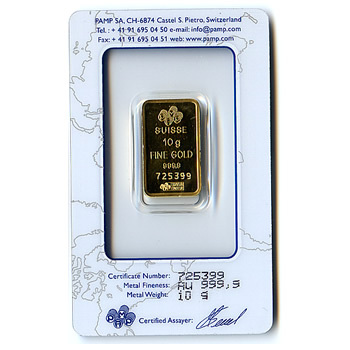 Reputable gold bar manufacurers take steps to ensure the purity, gold content and authenticity of the bars with unique serial numbers and tamper-resistant packaging. One Ounce Gold Bars represent the #1 choice by investors. These bars typically have very low premiums and are very easy to tie to the spot price of gold since spot gold price is normally displayed per one ounce. Historically, Switzerland has been a major manufacturer of gold bars. Two of the most popular bar manufacurers are PAMP Suisse & Credit Suisse. Recently, Pamp Suisse has overtaken credit suisse due to their beautiful designs and packaging. Smaller gold bars are a great way to get your feet wet in the gold market. They typically come in sizes ranging from 1 gram to 20 gram. With 31.103 grams in a troy ounce ounce, the math is fairly straighforward. The down-side to smaler bars is it takes the same manufacturing costs to produce them as the larger bars. This translates to a higher premium per ounce. Nevertheless they are still a great value and make a great gift item.